Front Street Shipyard’s new line of thoroughly modern performance sloops features three designs at 84’, 102’ and 112’ length overall respectively. The concepts, interior designs and exterior styling have been developed in-house at the Front Street Shipyard for construction at the shipyard. 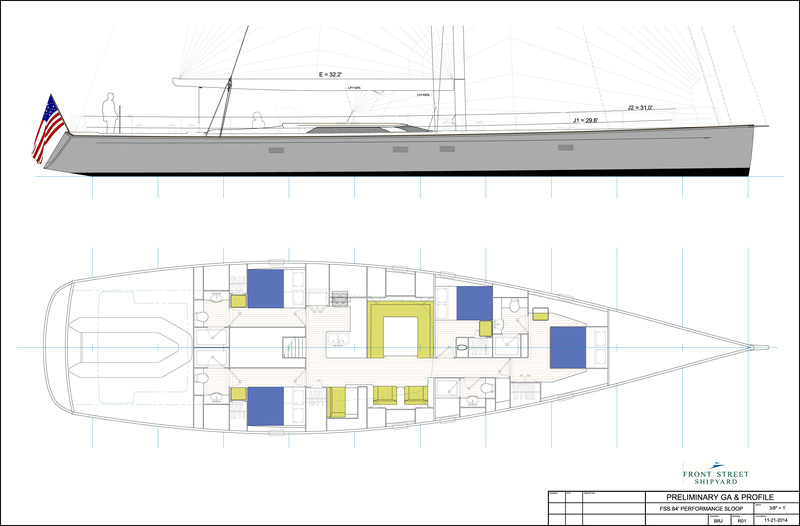 The 84’ and 102’ designs are primarily flush deck designs but with an aggressive low profile deckhouse aft of the mast primarily for additional light in the spacious main living areas. The 112’ is a true pilothouse boat. All three models include a central social cockpit protected by the deckhouse and an aft “sailing” cockpit. Each model has been developed with multiple interior layouts. The sailing systems are fully hydraulic with carbon fiber rig packages and twin headstay furlers, providing a working jib on the inner stay and a reaching sail on the outer stay. There is a bow sprit to handle the Code Zero or Alpha sail. The mainsail is to be handled with in boom furling. All winches are hydraulic self-tailing or captive, depending on the model size. Main sail: 1,669 sq. ft.
Jib (105% LP): 1,472 sq. ft.
Genoa (135% LP): 2,132 sq. ft.
Total area (100% Fore∆): 1,630 sq. ft.